Each year U.S. employers petition for over one hundred thousand potential foreign national employees to receive coveted H-1B visas and are summarily denied due to visa caps. Understanding what special considerations or exemptions may apply to you or your potential employees is imperative to increasing your chances of success in securing an H-1B visa. This article discusses the importance of the “master’s cap” exemption and how that may help or hurt employers navigating this complex process. Each fiscal year Congress sets a cap on the number of H-1B visas available to foreign workers seeking qualifying employment in the U.S. For FY2016, Congress set aside 65,000 general H-1B visas. However, consistent with the trends of past years, USCIS received nearly 233,000 H-1B petitions on April 1, 2015- the first day that such petitions could be submitted. Before narrowing down the petitions to 65,000, USCIS will first set aside petitions with candidates that qualify for the “master’s cap” – 20,000 additional H-1B visas available to candidates who have completed a master’s degree or higher from qualifying U.S. colleges or universities. Though the exact number of petitions for the master’s cap has not been released, the number of petitions has consistently exceeded 20,000. The process of determining which of the 233,000 petitions will be selected by USCIS is not based on the underlying merit of the individual candidate or the employer. Rather, USCIS utilizes a computer-generated random selection process, essentially a lottery. 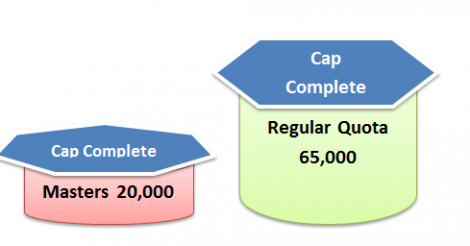 Importantly for those who qualify for the master’s cap, USCIS first randomly selects the 20,000 masters cap petitions and then all unselected master’s cap petitions are placed back into the remaining pool of petitions for the chance to be selected from the general H-1B cap of 65,000. A public or non-profit institution. It is critical that a candidate’s degree be carefully evaluated prior to filing for the master’s cap because a petition that is denied due to an issue with the degree institution will lead to a denial under both the master’s and general caps. While the master’s cap increases the likelihood of success for those with advanced degrees, it is becoming increasingly difficult each year for candidates with only a bachelor’s degree to succeed in the H-1B lottery. One way to combat this issue is to look for an exemption to the H-1B cap. Exemptions come in two categories- exempt candidates and exempt institutions. Candidates who are exempt from the H-1B cap are typically those who have previously been counted against the H-1B cap in prior years. Therefore, employers looking to extend the amount of time a current H-1B worker may remain in the U.S. or amend the terms of employment for a current H-1B worker will usually not be counted against the cap. Current H-1B employees may also change employers or work concurrently in a second H-1B position without being counted against the cap. Additionally, citizens of Chile, Singapore, or Australia may have other options for exemptions from the H-1B cap. Regardless of what avenue is pursued for H-1B candidates, it is vitally important to understand the full process and qualifications before filing and to ensure that there are no errors in the underlying petitions. The experienced attorneys at Ilex Law can help employers and candidates navigate this complex process.